In recent years, many commentators here have advocated “injecting clearer gas” [风清气] into Chinese politics, purging bad elements “for the purpose of building a cleaner political ecology” [正的政治生态] in the Communist party. That’s become a metaphor in some circles for fighting corruption by getting rid of the stench of sleaze that’s permeated Party ranks, replacing it with a cleaner environment for cadres to operate in, and residents to relate to. The language used is, as ever, crucial. Unlike past anticorruption campaigns, the idea isn’t just to remove people but to switch the atmosphere in which politics takes place. That way, the cadres that replace those removed would have to behave otherwise, because they’d be operating in a different environment, in which it’s easier for honest officials to breathe, and dishonest ones would suffocate. It’s smart thinking, and typical of the debates that mark the Communist party under Xi Jinping. 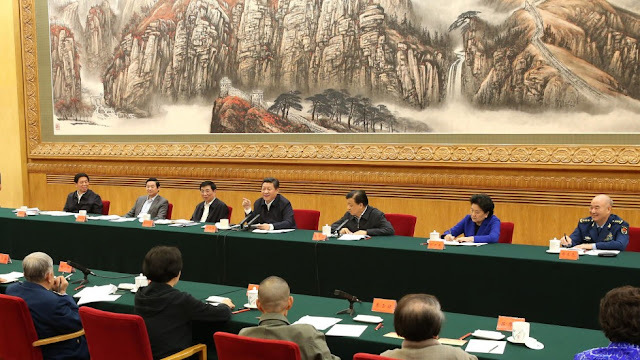 Call it resistance or reluctance, opposition or openness, rectification or restructuring—there are differences under discussion among senior leaders and their advisors about what sort of reform is required for the Party to be able to govern more effectively. The arguments are ongoing, and how and to what end they are resolved will help shape China’s political system. The problem is that, for at least some local officials, the sort of talk that happens in Beijing-- while crucial for the long term--doesn’t address the small challenges they confront every day here. Many of the problems governments face on the ground here lack easy solutions and have little direct link to ideological matters or grand policy. Such as the appearance of “black gas” [黑气]. That’s the name for illegal--or at least unregulated and uncertified--propane gas that’s increasingly being delivered to small restaurants in Jiangsu. These establishments, which are often unregulated and uncertified themselves, aren’t large enough to merit delivery from state-operated suppliers, but instead must rely on middlemen who buy half a dozen small canisters which are drained and then refilled, sometimes more than once during a given day. There’s a local social context here. Restaurants that have a larger footprint are often the targets of flying squads of inspectors who check for health and safety conditions, because that’s where large families dine out, as well as well-connected business people and officials; their owners depend on reliable delivery from established firms, and have secure schedules. Smaller eating establishments, on the other hand, continue to flourish in many cities and districts, townships and counties as migrants have relocated and taken their appetites and often their cuisine with them. These types of restaurants tend to be clustered around apartment complexes that are rented by workers and their families who have neither the time nor the inclination to cook for themselves as they might have done in their home counties. As the service economy in provincial cities and suburbs has proliferated and is increasingly staffed by non-natives (property sales representatives, office staff, installers and repair people), these dining places have a built-in demand for those wanting to eat in, or (increasingly) order for delivery. Getting cooking gas in a timely manner matters greatly to these small restaurants: They lack the place to store the bigger canisters, and larger suppliers simply won’t cater to them when they can get higher fees and more reliable demand from larger establishments. In short, commercial pressures create situations that outpace the capacity of local authorities to supervise these operations. And there’s little incentive to do so diligently, when these smaller restaurants add services and revenue to the economy. Shutting them down for various violations makes little sense, especially when the immediate result of such action is sometimes local anger. At the same time, the dearth of oversight can turn unsafe, as happened in Nanjing recently when a canister of bad propane ignited and critically injured 2 people, hurt another 10, and caused the evacuation of damaged properties nearby. Later the same day, local authorities started posting warnings in the neighborhood of the explosion, advising owners and patrons to be aware of the dangers of “black gas”, which, while cheaper and capable of almost immediate delivery, skirts safety regulations because they fall outside the existing scope of city supervision. Local officials don’t want to be seen as negligent, but they also prefer to avoid being perceived as harming the economy. There’s no real payoff for them (literally and otherwise) in pushing more regular regulation, especially when they lack the staff to do so. What’s left are campaigns—small-scale safety crusades where inspectors appear to enforce the rules that do exist, as well as remind businesses and customers to take care. But they know, as every resident here does, that matters will go right back to what they were, once the uniforms depart. How ideological construction or new anticorruption policies help local officials solve these sorts of challenges isn’t at all clear to many, especially outside of Beijing. It’s not all hot air, but for some at least, it probably seems that way. Or frustration for nearby residents who have to stomach cooking fumes, higher noise levels, and waste problems when illegal establishments aren’t closed.